Hillary Clinton won the foreign policy debate: The former secretary of state was strongest on international affairs. When it came to foreign policy, Hillary Clinton won the night. 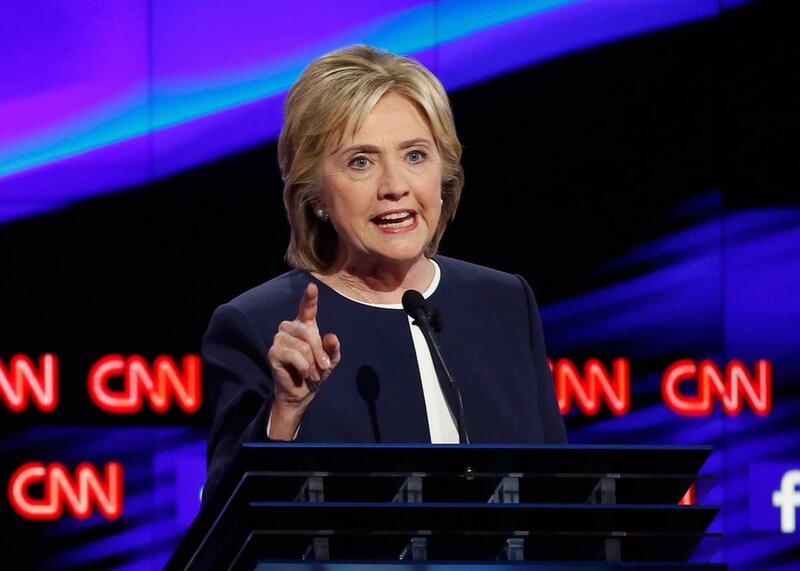 Presidential candidate Hillary Clinton speaks during the Democratic debate in Las Vegas on Oct. 13, 2015. One impression from Tuesday night’s Democratic debate: Vice President Joe Biden has no rationale to step into the race. If he’s been waiting until after this first prime-time test to see if Hillary Clinton collapsed, he must have seen for himself that she crushed it. When the debate turned to foreign and military policy, she had no peers on the stage. The few times she waffled or equivocated, her rivals were no more forceful in their answers or didn’t know enough about the issues to challenge her. In other words, she said nothing. But she paid no cost for her uncharacteristic incoherence. Sen. Bernie Sanders called Syria “a quagmire in a quagmire” (an apt description), passionately opposed sending U.S. ground troops to the area (a position no one had taken), but also said he supported Obama’s airstrikes. So he said nothing either. Sanders was asked under what circumstances he would use military force. He noted that he’d voted for President Bill Clinton’s airstrikes to protect Kosovo and for the invasion of Afghanistan. In general, though, he would use force “when our country is threatened or our allies are threatened,” though even then, only in coalitions, adding, “I do not support taking unilateral military action.” It wasn’t completely clear, but he seemed to be saying he wouldn’t take unilateral action against threats to “our country”—not a winning, or acceptable, view for a commander-in-chief. Clinton handled the inevitable Benghazi question well. First, she explained the roots of U.S. involvement in Libya: NATO and Arab allies begged us to get involved, the Libyan people faced an imminent threat of massacre, and NATO allies promised they would take the lead in rebuilding the country after the shooting stopped. She even called Obama’s decision to act “smart power at its best.” (The allies’ promise to rebuild didn’t work out.) On Benghazi directly, she said bad things happen, “unless you think that the United States shouldn’t send diplomats to dangerous areas”—and she said this without sounding heartless or flip. All in all, it wasn’t the most sophisticated debate on foreign policy in the history of American elections, but it wasn’t bad, and it ranked on the level of a college seminar compared with the grade-school antics of the Republican candidates’ chest-puffing festivals.